If you don’t need a high cost, high performance hand dryer, you would have to consider the Mediclinics Smartflow. It’s that good. With energy efficiency around 30% better than most other conventional machines (including the premium models), this machine really shines. Uses 70% of the energy required by most conventional hand dryers, even the expensive units. 5 x more energy efficient than paper towels (life cycle analysis). Up to 20x reduction in CO2 emissions compared with paper towels. Use of renewable electricity sources will reduce environmental impact. Reduces electricity usage by 30% over conventional hand dryers. Slashes cost per use by 99% over paper towels. Long life reduces total cost over time. High quality components, excellent vandal proofing and the best warranty in its class make the Mediclinics Smartflow a very sound investment. Compact size means less space required on the floor-plan and walls. The Mediclinics Smartflow hand dryer is one of the quietest machines on the market. Quality design and manufacturing mean that it stays quiet. 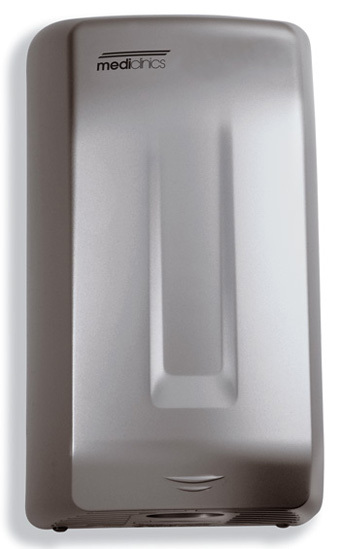 With modern European styling, the Mediclinics Smartflow hand dryer is a great looking unit that will fit beautifully in a wide range of interior designs. Three designer finishes make it very versatile – white and two chrome finishes, bright and satin. Solid 3mm thick ABS casing and excellent vandal proofing means high durability. The IR detection sensor is adjustable, allowing customising for various settings. Motor incorporates a self-resetting safety thermal cut-off at 100 ºC. Heating element incorporates a self-resetting safety thermal cut-off at 95 ºC. Cover fixed to the base by means of 2 vandal-proof lock screws. Casing is one-piece, solid, 3 mm thick steel ABS thermoplastic. Competitive? With this level of quality and performance, at this price, it blows the competition out of the water. It is more energy efficient than machines that are four times more expensive. It is a complete rethinking of budget hand dryer design. The Mediclinics Smartflow hand dryer has the best warranty in its class. If you don’t need a high-end machine, think about specifying the Mediclinics Smartflow. It is a re-thinking of budget hand dryer design, leveraging modern technology to create a low cost pocket rocket. It is far more energy efficient than most conventional machines, even the expensive ones, using around 70% of the energy per drying session. The energy efficiency means two things; lower environmental impact and lower running costs. 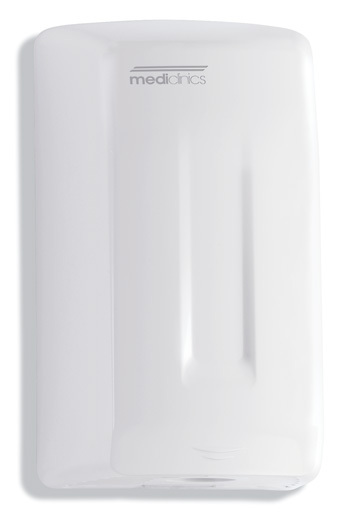 The Mediclinics Smartflow hand dryer comes in a choice of three finishes; white and chrome, bright and satin. The Mediclinics Smartflow hand dryer is one of the quietest machines in its class. The conventional, wall mounted format, makes it easy to specify for a large range of projects. The Mediclinics Smartflow hand dryer , above all, is a high quality machine. It is designed and manufactured in Europe to the highest standards, with all components sourced in Europe. Because of this, the Mediclinics Smartflow has the best warranty in the country. Talk about punching above its weight! The Mediclinics Smartflow is the smart, responsible choice for any medium traffic setting. With energy efficiency that outstrips almost all other conventional machines, and all the other benefits listed above – its difficult to overstate how good this machine is. It’s the leading edge of hand dryer technology packed into a very stylish budget machine. For medium traffic situations, the Mediclinics Smartflow hand dryer is the smart choice.